If you’re planning a holiday to Dubai with your friends and family, then all you need is a great plan and a Dubai visa. The application procedure for a Dubai tourist visa is extremely simple. A tourist visa for Dubai can be obtained by submitting your basic travel documents. With Musafir.com, getting a Dubai visa for Indians citizens is extremely simple and hassle-free. 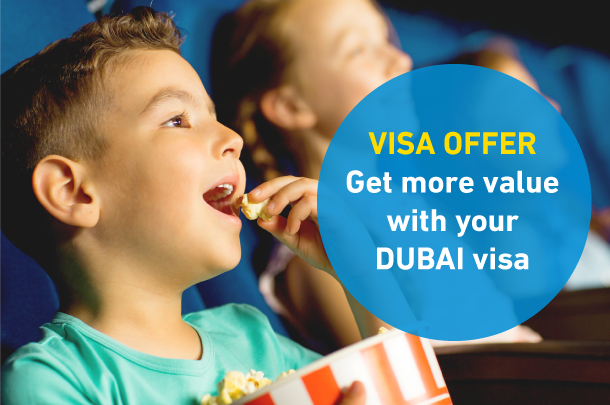 You can apply for your Dubai travel visa starting from Rs 3,649* and receive it in just 4 working days. For instant Dubai visa assistance, call us at 022-68311010 or fill in your details. Based on itinerary, plan and purpose of visit and stay in Dubai, you can opt for a 96-Hour, 14-Day, 30-Day or 90-Day Dubai visa. Last minute travel plans? We don’t want you to miss out on your favorite Dubai getaway. With our express visa service, you can get your Dubai visa in just 24 hours – just share your documents, and we will get your visa processed through our express service. We do not provide Dubai work / job / employment visa. Dubai visa price doesn't includes OK to Board charges. Please provide the flight ticket copies 48 hours prior to your departure to update Ok to board. Visitor Profiles likely not to be accepted. Make an online payment. The payment link will be mailed to you by us. Get your Dubai Visa Online in just 4 working days. Get complete details of the process here! *To know about OK to Board, please read our OK to Board information corner! Applying for a Dubai visa is a simple process. There’s no complicated documentation required, nor do you have to stand in the long queues. However, there are chances your Dubai visa application may get rejected due to a few reasons that should not be ignored. Know more about Dubai Visa rejection. 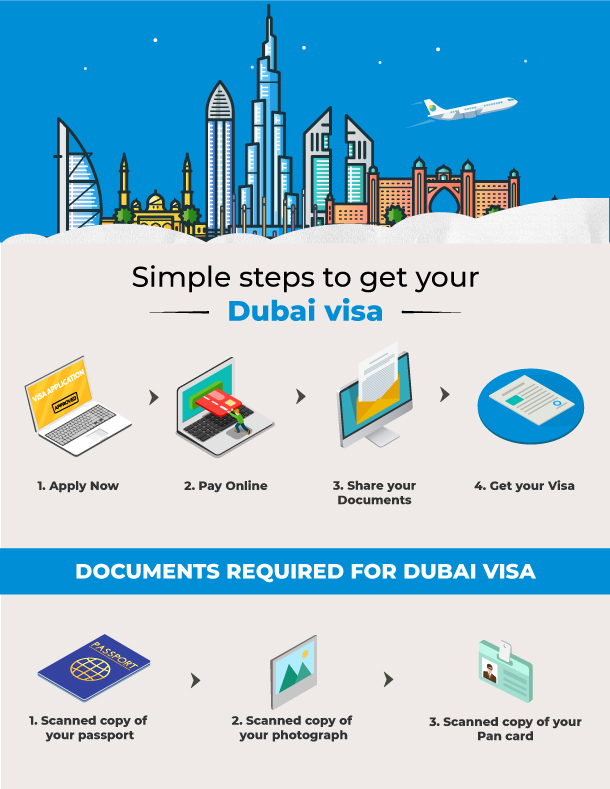 See how your UAE Visa will look like! Planning a holiday to Dubai with your family? There's no better time to book your holiday than now. Our value holiday itineraries have been designed specially to give you valuable experiences like never before. 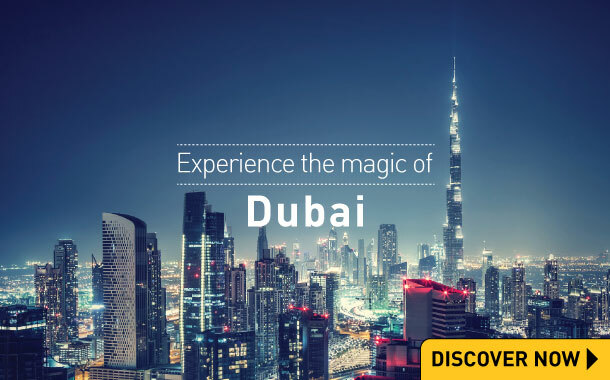 You can now Explore Dubai at just Rs 15,100*. Make this festive season extra special in Dubai. What are you waiting for? Book Now! Watch this video on Dubai Visa to get a better understanding of the process, necessary details and information. 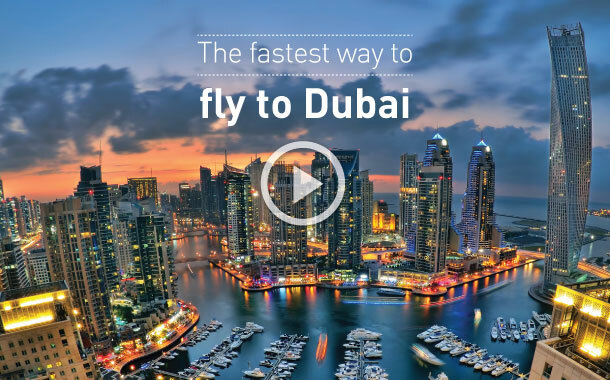 Here's the fastest and the easiest way to fly to Dubai in just 5 working days. Book your Dubai visa and holiday with Musafir.com, trusted travel partner for Dubai Tourism 2018 - 19. Why do you need a visa to visit Dubai? Indians visiting Dubai for the purpose of tourism must apply for a Dubai visa before travelling. Recently, Dubai has facilitated the option visa on arrival for Indian citizens. However, Dubai visa on arrival can be obtained by Indian citizens who have a valid US/UK/Schengen tourist visa. What is the validity of my Dubai visa? A 30 days Dubai visa is valid for 58 days and Dubai transit visa has a validity of 30 days. Children below the age of 18 years must provide the passport copies of parents. If you are planning to stay longer in Dubai, opt for our 90 days Dubai visa service. What are the Dubai visa requirements? What are the additional documents required to for a 90 days Dubai visa? 6) Apart from the above documents, immigration may ask for additional documents as deemed necessary. You can apply for Dubai visa anywhere between 58 to 5 working days prior to your travel date. Is there an age criteria for applying a Dubai visa? Yes, there is. Females below 25 years of age and males below 21 years of age need to apply for a Dubai visa along with their father, mother or husband to avoid any chances of rejection. All visitors should have a passport that is valid for a minimum of 6 months from the date of arrival in Dubai. In case your passport is valid for less than 6 months, you will have to renew it before applying for Dubai visa. Your Dubai visa will be mailed to you on the email address provided in the application form. Why was my Dubai visa application rejected? Unfortunately Dubai authorities do not give reasons for rejecting a visa application. Therefore, we cannot provide specific reasons as to why your application was unsuccessful. Look no further! Musafir.com provides Dubaivisa assistance in Mumbai, Bangalore, Chennai, Kolkata, Hyderabad, Pune, Lucknow etc. Dubai, a place where modern engineering meets history and culture, awaits to be explored. There are a plethora of things to be done and seen in Dubai. When choices are unlimited, experiences are limitless. Know anything and everything about Dubai through our comprehensive online guide and explore Dubai like a pro. Endless deserts and stunning skyscrapers, Dubai a city of uncanny verve and obsession for architecture has evolved into an edifice of wondrous engineering. Dubai’s anatomy, interestingly revolves around sky-high buildings and expansive bridges with a substantial spur of restaurants and supermarkets. Every vein that branches out from its heart, reaches a corner in its sprawling malls. The main town of Dubai is impeccably planned, all as the blazing hot Arabian deserts are a reminder of its austere historical and cultural fragments. The city of Dubai features some of the top ranked restaurants, iconic sights, vibrant nightlife and numerous adventure activities for adults and kids. Dubai also gives an opportunity to indulge in adventure activities like fishing, kayaking, hiking, rock climbing and stand-up paddling. The United Arab Emirates, popularly known as UAE comprises of seven Emirates. Each Emirate is unique, rich in its tradition with interesting places to visit and unique things to do. Better known among the emirates are Dubai and Abu Dhabi that are visited by tourists from all over the world. Go for a desert experience and enjoy the excitement of riding up and down the sand dunes in Dubai. You may visit one of the refreshing cold wadis in the Al Hajar mountains; for some cultural refreshment, visit Sharjah the cultural capital of Emirates. Visiting UAE is useless without exploring the tallest building in the world - Burj Khalifa. Stroll around large malls and have a delightful shopping experience. Want to explore how UAE looks like without the oil wealth? Then visit Umm al-Quwain, one of the least populated Emirates, for a perfect getaway from the bustling city life of Dubai. If you are planning to visit UAE, then apply for your UAE visa with Musafir.com. The process for application of UAE visa is hassle-free and very simple. You can apply for a visa from the comfort of your home by simply filling the forms provided by our visa officers. Our visa experts will process your visa within 5 working days and assure you benefits beyond comparison. From personalised assistance to delivery of visa on time, make your booking process comfortable and apply for your visa now. The all-inclusive prepaid pass, Dubai Pass has been relaunched with access to an additional 15 attractions and 48 experiences in Dubai. These new attractions are in addition to the existing experiences including Burj Khalifa, Dubai Parks and Resorts, IMG Worlds of Adventure, Desert Safari Tours, Dubai Frame, and Legoland. Visitors to Dubai in 2018 - More than 2 million Indians visited Dubai is 2018. According to the data shared by Dubai’s Department of Tourism & Commerce Marketing (DTCM), Dubai welcomed 15.92 million visitors from around the world in 2018. Not just Dubai but the entire UAE is being preferred by tourists, and 2019 looks promising as well. Over the last couple of years, the tourist visa application process and rules have been simplified for travelers. You can apply for your visa from the comfort of your home – share your documents and get your visa for Dubai. "Great work done by team Musafir in helping me with my visas. Its now been 3 occasions where I have acquired my visa through Musafir.Com, and would like to congratulate the team for handling the process with excellence! ~ Mohit Bhagnari"